A peregrine falcon nesting by a faulty transmitter has meant mobile phone reception has not been able to be restored to parts of Southampton. Vodafone engineers discovered a female bird nesting when they tried to repair the faulty mast on 9 April. The phone company said it could not legally access the mast until any chicks had fledged, possibly in June. Peregrine falcons are protected under the Wildlife and Countryside Act. The nest's location cannot be revealed. It is not yet known if the bird was the cause of the original fault. 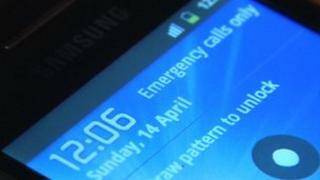 Mobile phone users left without signal have criticised the speed of Vodafone's response. Elizabeth Corbett said: "I understand the nesting birds are out of their control but their reaction to it has been extremely slow." Peregrine falcons became almost extinct in the 1960s after their existence was threatened by pesticides. They became a protected species in 1981. Legislation controlling use of pesticides meant their numbers slowly recovered. The Royal Society for the Protection of Birds estimates there are 1,402 breeding pairs in the UK. They nest in areas they consider resemble a cliff-face, such as tower blocks and church towers. A Vodafone spokesman said the company was being "very careful" in dealing with the protected species. "We're already looking at alternative contingency plans and we'll inform our customers as soon as we can. "While this is inconvenient for our customers, it is great news that the falcons are nesting in the city." There are about 1,400 breeding pairs of the birds in the UK. They normally favour rocky cliff tops to make their nests. Michelle Hawkins of Natural England said: "If anybody disturbs them during their breeding season, therefore threatening to stop their natural breeding, it is an offence which could lead to a prison sentence." She added that in "exceptional circumstances" a licence could be applied for to disturb a bird.